There is only one way to practice Yang Tai Chi Chuan, and its the way the Yang Family taught it and passed it down from one generation to the next. Beware, if someone comes along and changes these very important principles to make it easier to learn or more fun to do, or removes any of them from the form, because then its no longer Yang Style Tai Chi but something else entirely. When practicing the Yang 108 Form, all of the Health and Martial benefits come out of applying Yang Cheng Fu’s 10 principles listed below. To maximize the benefits this exercise has to offer, follow these principles while doing your Tai Chi form. If you’re interested in learning authentic Tai Chi, seek an instructor in your area who teaches these principles correctly while you are doing your form. Any exercise can be performed incorrectly. This can reduce the benefits and maximize the potential for injury. Tai Chi is a low impact exercise and performed correctly is very healing, reducing/eliminating the risk of injury. Practicing the form with the correct principles, however, will speed your progress and increase the potential for positive benefits. 1. Elevate the crown and lift the spirit, the head should be upright so the Shen or (spirit) can reach the top of your head. Don’t use Li (force), or the neck will be stiff and the chi (breath) and blood can not flow through to the head. The feeling should be natural and buoyant. Remember, if your head is not up your spirit will not be raised. 2. Contain the chest, expand the back. The chest is slightly sunken so that the chi can sink to the dantien, If the chi gets stuck in the chest, the body will become top heavy and you will be easily uprooted. The back should be lifted or plucked up to avoid promoting kyphosis and also as a way to release power (jin) through the spine. 3. Sung (Relax) your waist, the waist is the commander in charge of your whole body. If you can relax your waist then your legs will have the power and your lower parts will be stable and strong. It is said that the origin of the postures (jins) comes from the waist. If you lack power, the defect is in the legs and waist. 4. Understand the difference between insubstantial and substantial, this is one of the very first things you will learn in Tai Chi Chuan. If the weight is on the right leg, then the right leg is substantial and the left leg is insubstantial. When these can be separated and consciously acknowledged, you will be able to turn lightly without using any tension or stress. If you cannot get this concept your step will be heavy and slow and your stance will not be steady, then you will easily be thrown off balance. 5. Sink the shoulders and drop down the elbows. Your shoulders should be completely relaxed downward and open to the sides, the opposite of this is uptight with the shoulders lifted up and in, this is a powerless state. Sink the elbows, this means that your elbows move downward and stay relaxed, if you raise the elbows the shoulders also go up. Keeping the shoulders and elbows down gives your body internal power that can be used to throw your opponent far. The health benefits of this principle are too numerous to name here. 6. Use the mind (Yi) and not force (Li). When practicing Tai Chi Chuan your whole body relaxes. 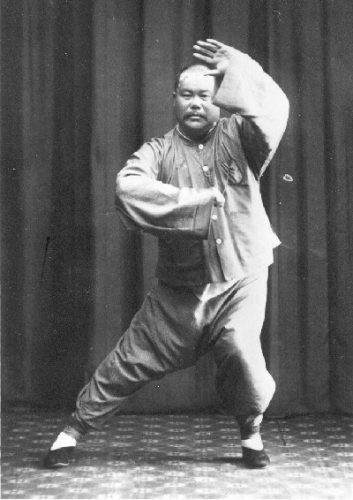 The tai chi chuan classics tell us to use (yi) the mind, and not (li) force. When you practice tai chi chuan the whole body relaxes, not even letting one ounce of force remain anywhere in the body. When this is achieved you become agile and able to change easily. The classics say when you are extremely soft, then you become extremely hard and strong. A person with these qualities will have arms like iron wrapped in cotton and the weight of them is very heavy. This is a powerful state of being in Yang Tai Chi. When the spirit (Shen) is raised the mind/ intention (Yi) can focus. Now that the intention (Yi) is high, the energy (Qi) is full and follows. When the energy (Qi) is activated, the body is pulled, these are the 3 Internal Harmony’s. The 3 External energies (San Wei He) are 1. Shoulder / Hip. 2. Elbow / Knees. 3. Hand / Foot. As you move, the external body coordinates as you relax (fang song) the shoulders into the hips, the elbows into the knees and the hands into the feet. Relaxing into the movements sends the energy and blood (QiXue) out to the limbs, now the whole body is nourished, regulating blood pressure, relaxing the soft tissues and veins/arteries and calming the entire nervous system. The mind and body are now working together through the 6 harmony’s as we practice our form. The Tai Chi Classics say the body moves as one unit, however in applying these 6 harmony’s we can see that although the body moves as one unit, it does not all move at the same time. 9. Continuity without breakage. From beginning to end Tai Chi movement is continuous and not broken, after each movement its starts again circulating without any end. It is circular in motion like a continuous wave without limits. The classics tell us the circulation of (jin) is like pulling silk, everything is connected together. The form does allow for a brief rest at the end of the movement before going onto the next. The classics tell us the jin is broken the yi is not. 10. Seek stillness within movement. In Tai Chi we use stillness to control movement, even though we are moving, there is still stillness. It is good to practice your form slowly, with calmness and awareness. Meditation alone always seeks movement is stillness, but in Tai Chi Chuan we seek stillness in movement. Tai Chi is known as moving meditation. Note: there are 13 principles altogether, this is the abbreviated version. All classes are taught by Sifu Michael Paler, 7th Generation Lineage Holder of Imperial Yang Family Tai Chi. Sifu Michael has been teaching Tai Chi Chuan for over 20 years. 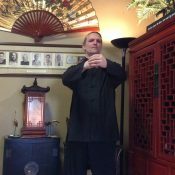 In addition to owning and teaching full time at his Colorado Springs school, the “Tai Chi Association of Colorado Springs”, he also offers a complete online curriculum perfect for beginner’s and long distance students. Sifu Michael is also involved in teaching at the US Olympic Training Site, he helps the athletes to use their body’s more effectively using the above Tai Chi principles. I am also involved in teaching naturalness through a good movement from the spine. Im in California until 18 sep.Maybe wr could meet up and share ideas. There some informative blogs written by my colleague Dr.Laurie Rauch, a neurobiologist.He explains the importance of a natural good movement and how the outer good rhythm takes care of the inner rhythm by creating coherence between blood pressure, heart rate, breathing(timeing). Thanks. The way the principles are written, they are fairly easy to understand. However an even more basic explanation would help me begin to understand the principles and how to bring them to my practice. Eg “when the chest is slightly sunken”. What does that mean? What does it look like, a sunken chest? Julie, thank you for the info – the more information like this I read, the more I understand what I am learning during my daily warm-up exercises and the more I appreciate Michael as a teacher. Making progress and enjoying it. My doctors are really supportive – have “graduated” from physical therapy … in fact, they also do Tai Chi. The video on the lymphatic system was also very helpful.